This thread will concentrate on foods available in the UK while a list of suppliers can be found on the UK Sources and Supplies Info thread. While some of the UK foods may be available in other parts of Europe, searching for nutritional information for European brands should be easier with a separate thread. As the nutrition page on the main GL site states, we all have our own thoughts on what to feed our pets; ideas shaped by preconceptions, tradition and our own views on human nutrition. Cost, availability and convenience also come into play. A few people will strive to provide an all natural diet, but the majority of us will include a commercial guinea pig food, along with grass hay and fresh vegetables. See A Proper Diet is the Cornerstone of Good Health. 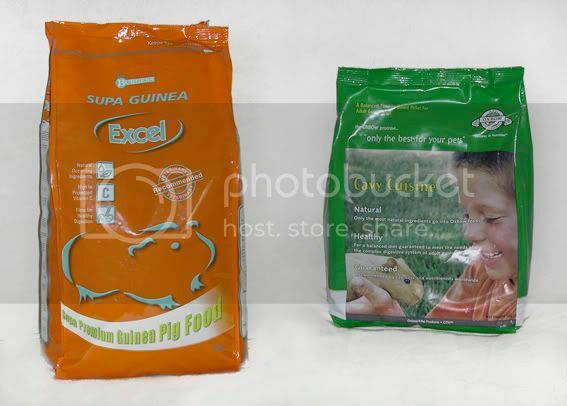 Commercial guinea pig feeds generally fall into 2 categories, mixes and pellets. There are wide selections of mixes and mueslis coming on the market all the time with some supermarkets also taking out their own brands and variations. These are usually made up of various cereals, seeds, vegetables and fruit pieces in various forms. Generally not recommended, they can lead to selective feeding where the guinea pig picks out its favourites ending up with an unbalanced diet. Mixes often contain less fibre, making unlimited hay even more important in the daily diet. The more commercially available mixes are also more likely to have preservatives and colourants in them, possibly contain choking hazards such as certain seeds or have a high cereal content which can lead to obesity or gas problems in the gut. The cheaper ranges also tend to have more cereals than anything else, reconstituted by-products and less vitamin/mineral content. Some of the 'better' mixes include Pets at Home Guinea Pig Muesli, Burgess Supa Guinea and Spillers Guinea Pig Muesli. Guinea Pig Fruit & Fibre from The Natural Pet Food Company is non-GM and organically grown but is more difficult to obtain. Two of the most widely available mixes are Wagg Guinea Pig Crunch and Gerty Guinea Pig which are also available in most supermarkets although I'd personally avoid the Gerty Guinea Pig. My own vet and also Edinburgh Veterinary College have said that additives in Gerty Guinea Pig Food seems to be a factor in an increasing number of guinea pigs having symptoms of diabetes. The Cambridge Cavy Trust have also commented on this saying some additives can cause irritation to the GI and urinary tracts and give high glucose readings in the urine. Also look out for locust beans in the list of ingredients. Although many guinea pigs love the taste of them, they have been removed from several commercial rabbit and guinea pig mixes due to the choking hazard of the small, hard, shiny seeds inside. It is also worth noting that in an emergency, making a mash for syringe-feeding a sick guinea pig is almost impossible with a mix, whereas a pellet food will mash down quite well with a little water and still contain all the nutrients and fibre of the original pellet. There is a growing choice of pellet food for guinea pigs in the UK as owners become more health conscious (even towards their pets) and petfood companies see opportunities to expand. They are not all of the same quality or nutritional requirements so check the labels as many contain poor quality ingredients either as fillers or to keep the cost down. Combined with other quality foods, pelleted feed can be a convenient way to ensure your guinea pig is getting the necessary nutrients and help prevent selective feeding. In the UK, the two favoured ones are Burgess Supa Guinea Excel (on the left) and Oxbow Cavy Cuisine (on the right). Burgess Supa Guinea Excel is the widest available one at the moment. It's recommended by vets in the UK as it prevents selective feeding, has a protected vitamin C content and contains prebiotics. It is available in many vet surgeries, pet stores and online. Wheat, Lucerne Meal, Cooked Non GMO Soya Beans, Peas, Oat Hulls, Unmolassed Beet Pulp, Brewers Yeast, Soya Oil, Dicalcium Sulphate, Calcium Carbonate, Fructo-oligosaccharides. Contains no coccidiostat (added to some rabbit foods). While not ideal, Burgess do at least seem to be listening to customers' requirements. They have removed the fish oils that were once included and also made the pellet size smaller - it was originally almost double that size - because of customers requests/complaints. We did query the Unmolassed Beet Pulp as a source of fibre with Burgess and their Technical Director has given the following information. Generally speaking the Burgess research is done through Leeds University and they use UNmolassed beet pulp as one source of fibre as it is one of the better ones that are available here in the UK. They have not found any problems with the use of it in herbivores; either rabbits, guinea pigs, horses or dairy cattle. He's not sure about it causing problems in cats or dogs as they don't produce feed for these type of animals. He was aware of the Oxbow products and does spend time in the US researching alternatives and improvements. He mentioned the longer list of ingredients on Oxbow products being due to the US regulations for declaration. The UK and Europe don't have to declare all of these even if they are in the feed. Most commercial feed makers get the trace elements and vitamins delivered in a basic supplement, Burgess use Roche as their supplier of this, who also supply most of the European manufacturers of guinea pig food, so they will pretty much all contain the same basic supplements. He stated that the Oxbow product has much the same supplement content as that from Roche. He went on to explain that all ingredients are listed in order of quantity as required by the Foods Standards Agency so the majority of the Burgess pellets are made up from Wheat, Lucerne Meal, and Cooked Non GMO Soya Beans, while the Peas, Oat Hulls and Unmolassed Beet Pulp are in smaller quantities. The Beet Pulp is included as when they look for crude fibre to be added to the feed, they look for different lengths of fibre, not just one bulk type. He noted that they make a point of using wheat and not wheat middlings which are basically a by-product, same with the soya beans. Burgess use the whole bean which helps give the slightly higher protein content and not just the hulls which are really there for fibre content in Oxbow. UK legislation does not require us to declare every single nutrient in our formulations. We have to declare the Nutritional Analysis and major ingredients only. Major ingredients are: Wheat, Lucerne Meal, Cooked GMS Free Soya and Soya hulls, Peas, Oat Hulls, Unmollassed Beet Pulp, Yeast, Soya Oil, Dicalcium Phosphate as a source of Calcium + Phosphorous. In addition we add a prebiotic * Profeed * to encourage healthy Bacteria in the Digestive System. We add extra VITE ourselves and buy a supplement, which is added to every tonne. The supplement is made for us and contains Protected Vitamin C and a host of Vitamins/trace elements * 28 in all. The formulation of the major raw materials is important since we want a mix of digestible and indigestible fibre in the 15% of Crude Fibre in the diet." 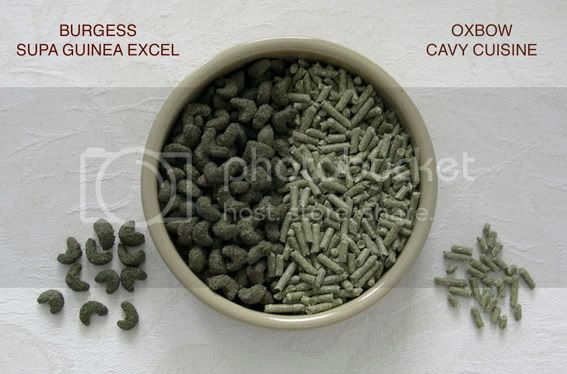 Oxbow arguably make the best guinea pig pellet food although it can be harder to find. There are several sites to buy from online, but more and more pet shops and vet clinics seem to be offering them now. Some may only be on a special-order basis but it's worth asking. Cavy Cuisine (Timothy based by Oxbow) for adult guinea pigs. Timothy Meal, Soybean Hulls, Wheat Middlings, Soybean Meal, Salt, Limestone, Molasses Products, Yeast Culture, Vitamin A Acetate, Vitamin D3 Supplement, Vitamin E Supplement, Monophosphate L-ascorbic Acid, Menadione Sodium Bisulfite Complex (Vitamin K), Riboflavin, Niacin Supplement, Calcium Pantothenate, Vitamin B12 Supplement, Biotin, Thiamine, Pyrodoxine Hydrochloride, Folic Acid, Lysine Hydrochloride, Sodium Selenite, Ferrous Sulfate, Manganese Sulfate, Zinc Sulfate, Zinc Oxide, Calcium Iodate, Cobalt Carbonate, Copper Amino Acid Complex, Zinc Amino Acid Complex, Manganese Amino Acid Complex and Cobalt Glucoheptonate. Cavy Performance (Alfalfa based by Oxbow) for guinea pigs under a year old. Alfalfa Meal, Soybean Hulls, Wheat Middlings, Soybean Meal, Salt, Monophosphate L-Ascorbic Acid, Molasses Products, Yeast Culture, Vitamin A Acetate, Vitamin D3 Supplement, Vitamin E Supplement, Menadione Sodium Bisulfite Complex (Vitamin K), Riboflavin, Niacin Supplement, Calcium Pantothenate, Vitamin B12 Supplement, Biotin, Thiamine, Pyrodoxine Hydrochloride, Folic Acid, Sodium Selenite, Ferrous Sulfate, Manganese Sulfate, Zinc Sulfate, Zinc Oxide, Calcium Iodate, Cobalt Carbonate, Copper Amino Acid Complex, Zinc Amino Acid Complex, Manganese Amino Acid Complex and Cobalt Glucoheptonate. Oxbow also produce a wide range of other products such as hays, vitamin c tablets and emergency handfeeding supplements for sick guinea pigs. Both Burgess and Oxbow Cavy Cuisine seem to be an acquired taste for many pigs, it depends how long you want to persevere. Some pigs I know of won't touch either at all. Guinea Pig Nuggets is in the Pets At Home range which have a similar breakdown of ingredients and nutritional analysis to that of Supa Guinea Excel. They are a more cylindrical compressed pellet in a greenish colour. Only available through Pets At Home. Wheat, Grass Meal, Soya, Peas, Oat bran, Unmolassed Sugar Beet Pulp, Brewers Yeast, Vegetable Oil, Dicalcium Phosphate, Calcium Carbonate, Fructo-Oligosaccharides (Profeed min 0.25%). Guinea Pig Goodness contains meadow grasses and cereals in a light, crispy kibble, all in a recipe made with only pure, natural ingredients. Grass meal, barley, oatbran, soya, linseed flake, sugar beet pulp, wheatbran, yeasts, sunflower oil, dicalcium phosphate, mineral and vitamin supplement, Profeed®, vitamin C. Contains no artificial colours, preservatives or antioxidants. Science Selective Guinea Pig is designed to combat selective feeding in guinea pigs, made with a blend of tasty herbs with added Vitamin C and comes in a fibrous biscuit shape. Alfalfa, derivatives of vegetable origin, cereals, vegetable protein extracts, vegetables, vitamins and minerals, seeds oils and fats, fennel, dandelion, nettle, lysine, DL-methionine, oligosaccharide - MOS. lysine - An essential amino acid found in proteins; occurs especially in gelatin and casein which are animal products. gelatin also gel·a·tine - A colorless or slightly yellow, transparent, brittle protein formed by boiling the specially prepared skin, bones, and connective tissue of animals and used in foods, drugs, and photographic film. casein - A white, tasteless, odorless protein precipitated from milk by rennin. It is the basis of cheese and is used to make plastics, adhesives, paints, and foods. DL-methionine - A crystalline sulfur-containing essential amino acid that occurs in the L-form as a constituent of many proteins (as casein and egg albumin), that is important especially as a source of sulfur for the biosynthesis of cysteine and as a source of methyl groups for transmethylation reactions (as in the biosynthesis of choline, creatine, and adrenaline), and that is used as a dietary supplement for human beings and their domestic mammals and poultry and in the treatment of fatty infiltration of the liver. Optimum consists of a single all-in-one nugget, containing a wide variety of the highest quality ingredients and balanced nutrition to avoid selective feeding. Fortified with natural antioxidants and vitamins, Optimum can help strengthen your guinea pig's immune system. Added fibre and yeasts help improve digestion. Extra Vitamin C has also been added, which is so essential as part of a healthy guinea pig's diet. Wheatfeed, Sunflower, Grass, Oatfeed, Maize, Locust Bean Meal, Syrup, Vegetable Oil, Yeast, Vitamins and Minerals. A few of the products commonly found in guinea pig feed and used as sources of fibre are listed here. A co-product of the flour and semolina (pasta) industry. They contain bran, germ and small amounts of starch. The outer covering of the wheat kernel. The bran is a brown paper-like coating that is high in fibre. It is removed when wheat is processed into refined white flour. Also called millers' offal and wheat offals; by-product from milling of wheat, other than the germ; bran of various particle sizes and varying amounts of attached endosperm. The outside layer of the oat grain. The grain is used in breakfast cereals and baked goods. By-product from cereals such as straw. The fibrous husks from around the grain. Oat hull fibre is an insoluble source of dietary fibre, derived from the outermost layer of the oat grain. Since most of the hay available in the UK is meadow hay, here is a useful comparison. On the left is Oxbow US timothy hay, in the middle is Pets at Home UK timothy hay, on the right is local pet store supplied meadow hay. For those unable to get a hold of Oxbow Timothy Hay you might find this one by Sun Seed in pet shops. It's better quality than Pets at Home and some other 'home grown' timothy hays but is a little pricey for it's size. It's still imported Western Timothy Hay but in a smaller bag and cheaper than the cost of Oxbow delivery. May be a treat for those with only a few pounds to spend and unable to get Oxbow. If good quality hay is hard to find from online supplies or locally, (also try horse feed suppliers) there is a good quality alternative available in some supermarkets and pet stores. 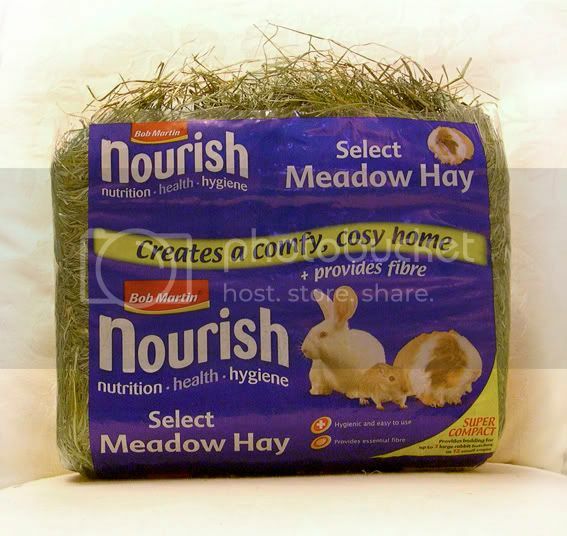 It's packaged by Bob Martin in a range called 'Nourish' for small animals. It's sweet smelling, dust extracted and good green meadow hay. Always look for the greenest hay you can find. Our piggies liked the Simply Grass best! They also liked the Field Fresh Timothy and Rye. 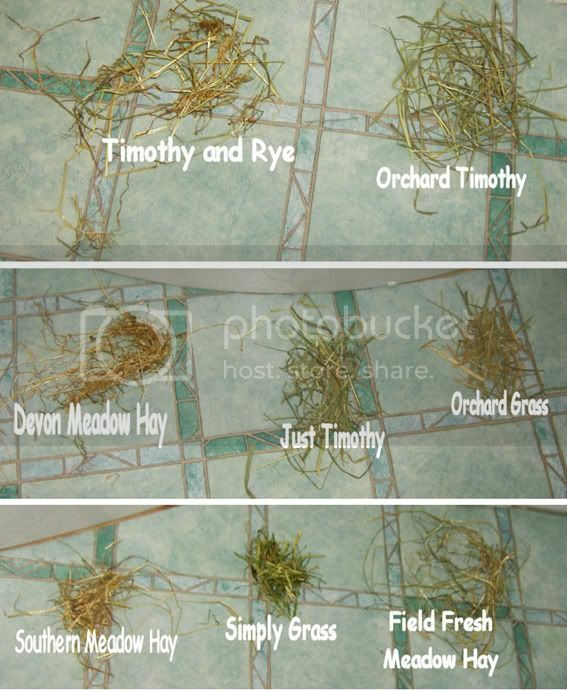 Ryegrass and timothy grass are generally 2 of the 5 grasses grown to produce meadow hay. Note that hay or grass known as 'lucerne', particularly labelled as such in the UK and parts of Europe, is actually alfalfa and has a higher calcium content. Just as an additional source of fibre to hay, there are also forages called Spillers ReadiGrass and Burgess Supa Forage which are basically dried grasses. 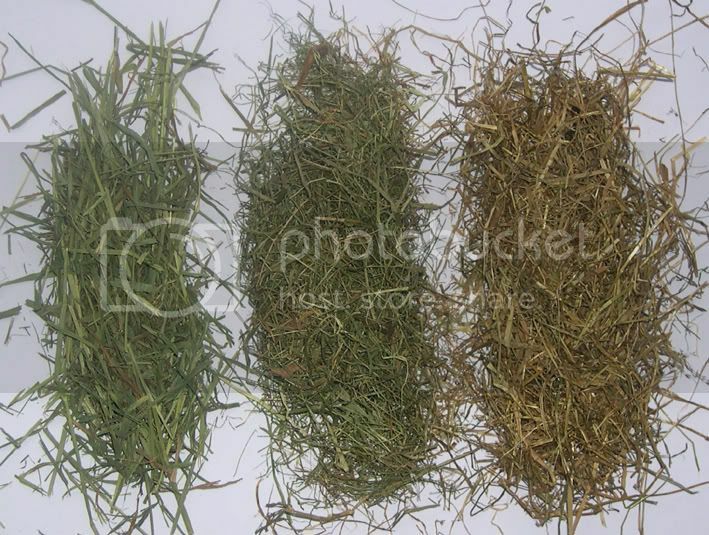 For comparison, on the left is Oxbow timothy hay, in the middle is Spillers Readigrass and on the right is local grown meadow hay. The advantage of dried grass is that it is slightly higher in nutrition and is useful for fussy pigs or those that require a pick-me-up after illness or loss of appetite. For healthy pigs, I'd just use it as a supplement sprinkled on top of hay to encourage them to eat the hay or put a small amount in a bowl. Use as a supplement, rather than an alternative to hay. Both are dust extracted, unmolassed pure dried grass with the main difference being in the fibre content and Supa Forage having a specified Vitamin C content. 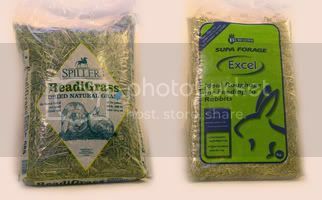 Both are 1kg bags with the ReadiGrass also available in 18kg bags as it's also a horse feed. Supa Forage is available from most pet stores that carry the Burgess Supa range or online. ReadiGrass is available from horse feed suppliers or online. Protein 15%, Oil 2%, Fibre 32%, Calcium 8g/kg, Phosphorus 4g/kg (Ca:P ratio 2:1), dry matter 90%, metabolized energy 11.5-12 mj ME/kg. Protein 15%, Oil 2%, Fibre 20%, Vit C 150mg/kg, correct Ca:P ratio (no less than 1.5:1 and no more than 2:1), metabolized energy 11.5-12 mj ME/kg. Protein 7%, Fat 1.5%, Fibre 32%, dry matter 85%. Remember that this is a HAY and NOT dried grass. NOTE the higher protein value in the dried grasses. 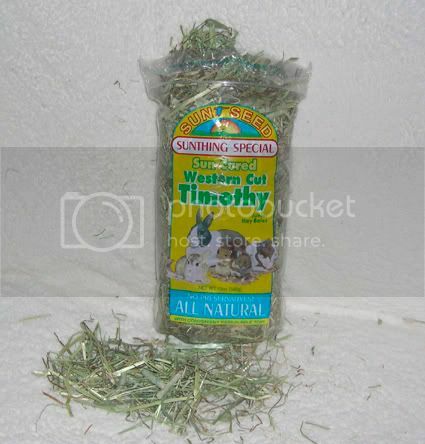 A newer product on the market is Excel® Herbage which is mainly Timothy Hay with herbs. Marigolds provide an important source of Lutein with its natural anti-viral properties to help support the immune system whilst dandelions aid urinary tract health. Also has the correct calcium to phosphorous ratio. Dandelions aren't really appropriate for older pigs that may have issues with calcium intake, and mature dandelions will have a higher oxalate content. There is further information here on marigolds in food and for info relating to the marigolds in western medicine. 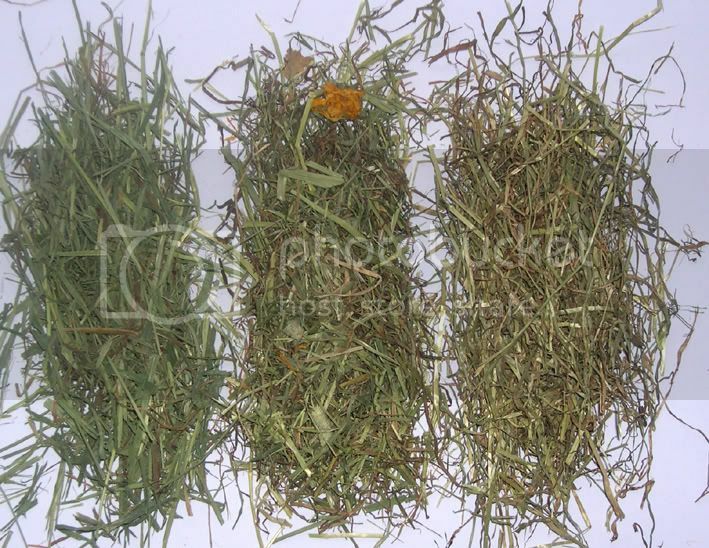 Although containing only a small percentage of marigold and dandelion, it may be best fed as a supplement or treat rather than full time hay, similar to the forages above. A wide range of natural products such as dried grass, herbs and leaf mixes from the Naturals company have also recently come on the market which can be fed as a treat to your guinea pig. They are ecologically grown and contain no additives or preservatives. They are available in some pet shops and selected UK online stores and are certainly a better alternative to the more traditional treats. Of course there are also fresh grass (when available) and other forages such as dandelion leaves, plantains and herbs. Not to mention the many fresh vegetables and ocasional fruits to add to the guinea pig diet. For comparison, on the left is Oxbow timothy hay, in the middle is Burgess Excel Herbage and on the right is Burgess Excel Supa Forage, both mentioned above. In my opinion, these last two are slightly better quality than the Pets at Home Timothy Hay or the local meadow hays - both being softer and greener, but they are a bit more expensive. This appears to be due to the quick drying process used rather than naturally drying outside. 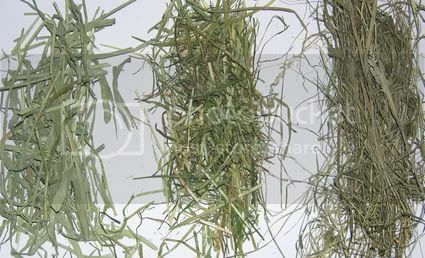 They are also marketed as' dried grass' rather than simply hay. They are cut when still quite green and dried similar to grain drying. 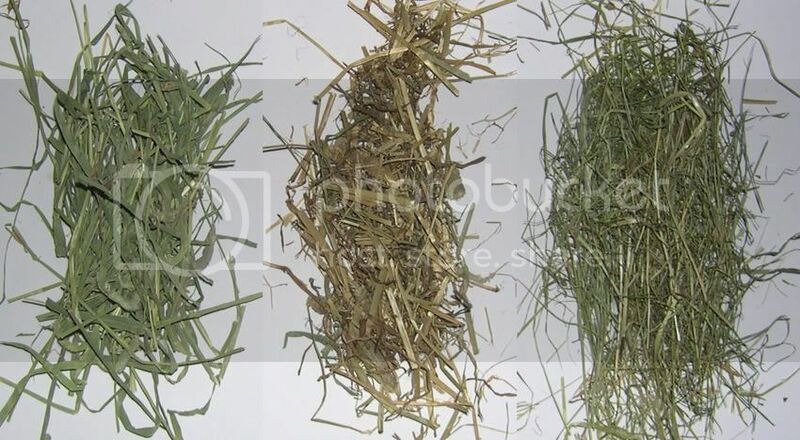 Again for comparison, on the left is Oxbow timothy hay, in the middle is the new version of the Bob Martin 'Nourish' meadow hay, now called 'Little Critters' and on the right is Comfey Pet UK meadow hay. Both these last two hays are marketed as bedding first and to be fed as 'unlimited fibre' second. One point on both these and probably why they are marketed as bedding, is they are fine hay strands and very soft to the touch - with no stalky or sharp bits. What a great piece of work - clear and concise - I’m in Scotland by the way. I realise this thread started in 2007, but is is OK to give a ‘heads up’ on the Science Selective Guinea Pig nuggets? A year ago I ordered a bag of this from our local pet shop to try. My two guys at the time (Jakey and Sammy) absolutely loved it. To cut a long story short, after a few days using the Science Selective, I came downstairs one morning to bring the boys breakfast, and discovered Jakey in a bit of a panic, pawing at his mouth and shaking his head. I couldn’t think what the matter was, and believing he may have got a bit of hay stuck in his teeth I gave him a few minutes to see if he could dislodge it. I got worried because he seemed more and more distressed. I lifted him up to look in his mouth - and stuck firmly on his top set of incisors was a Science Selective nugget. For anyone who hasn’t seen them, they have a small hole in the middle. I was able to remove it by gently tugging. I have to say that Jakey has always been a ‘petite’ pig, he was small when I adopted him, due I believe mainly to a very poor nutritional start in life. However, thinking it was a one-off situation, (maybe the nugget had a larger-than-usual hole), but not wanting to have a repeat performance, I then spent the rest of the week cutting each nugget in half with a sharp knife! It took hours! I also e-mailed the manufacturers, telling them what had happened, and suggesting that the nuggets in their present form might not be suitable for younger or smaller pigs. Surprise surprise - I never received the courtesy of a reply. I don’t therefore know if the Science Selective nugget is still in exactly the same form? Glad to hear you took the time to write them. It was not considerate to fail to reply to you. At least Burgess does not have a hole in the middle.